Specialists in South American, Spanish period furniture, French and Italian Designs and accessories. The Romani Family has over 100 years and 3 generations of experience. Spanish furnishings from the Gothic period through the Nineteenth Century, offering a treasure house of ideas and details. The furnishings reflect a very important period of rich Spanish history and many cultural influences. They are all displayed here. There are folk motifs, cabinets, chairs and beds of folk designs. The multiplicity of cultural influences combine to create a wealth of designs and variety. 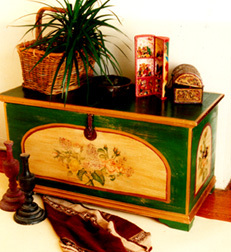 The French, Italian and European designs are mostly handpainted to order, depending on your taste. Catalonian, Florentino and French style armoirs, dressers, beds, chairs and tables. Many are handpainted to order! Lovers of fine Spanish period furniture; decorative French and Italian designs; special and uncommon pieces; and all who take pleasure in things of beauty will enjoy the flavor and charm. Products include: armchairs, barstools, beds, benches, bookcases, boxes, candleholders, chests, commodes, consoles, desks, dressing tables, dressers, picture frames, mirrors, secretaries, sofas, tables, TV cabinets, wardrobe cabinets (armoirs), etc. The following pictures are our most popular pieces we have created for our clients. We are also always designing and adding to our product list. We are able to work with you to design a unique creation! Your comments are welcome. Please enjoy your self guided tour. Some pictures and prices were not available at the time of creation of this website. Please call or email for more information. We are a proud member of the Malibu Chamber of Commerce. R&R International (C) 1997 All rights reserved.